Blimey, this is the second posting in less than 24 hours (here). I must have had a bang on the head or paid the electric bill. Something like that. Well the news is all about snow, wintry conditions and how we're all heading into months of freezing temperatures. I've long thought it was an interesting omission of the climate change journalists a decade or so back, in that they forgot to tell us in the middle of their sooth sayings that we'll all frizzle in the summer, that in the winter there'll be a lot more energy in our weather systems, and therefore more moisture in the air, which when the air turns cold could lead to more snow than we've been used to of late. I'm not complaining for one. I love snow. Makes life difficult travelling, but it's beautiful to look at. Unlike this chap who was seen walking in the 1/2 inch of snow we had this weekend on the Somerset coast. Note the sartorial elegance of his baggy trousers, the raffish tilt of his bobble hat, and what is he wearing under that fleece? It is a smorgasbord of bulges and sticky-outy bits. At least I think it is what's causing that effect. Anyway just after this we were chased by a herd of frisky bullocks, obviously desperate to discover the source of those many bulges. Maybe they thought is was hay! So far, as alluded to, down here we haven't had much snow. More of a dusting really as can be seen from the window of my house this weekend. Its enough to keep me happy at the moment, especially as we're all travelling to WWT Welney on Friday to make a radio programme in front of a live audience on Saturday. I hope we get snowed in, then I can indulge in some birdwatching on the fens. The snow that fell on Friday night was unexpected, as the forecast said it would miss us. And so in fabulous sunshine on Friday morning, I put my weks washing out.... Oh dear this was the view on Sunday morning, a mere 48 hours later. Eventually it defrosted itself and dried and was put away. But it was well rinsed through, and smelt fresh. By the end of the weekend the snow had all but melted here, but the temperatures were freezing all day yesterday and today I woke to more snow, the lightest of powdery snow gently falling as dawn broke. What is worrying me is that although I have all the feeders out and full, there are hardly any birds about. Its puzzling. I back onto open countryside as far as the Black Mountains in Wales. I've only been in this house since December 2009, but lived just around the corner for 10 years and used to have loads of birds there. But here all is quiet. I appreciate my garden is mainly grass and decking, but at the back of me are many thick shrubs, then nothing but classic dairy farmland of grass and hedges for 2 miles to the Bristol Channel. There are cats about, but there always have been. So where are they? I noticed on Ragged Robins blog she mentions a lack of collard doves. Funnily enough I saw my first one for ages this morning. Collard doves are in a decline for reasons no one really knows, but this weather must affect them as they are birds of much further south in Asia. Last winter took its toll on many birds at the northern edge of their range. 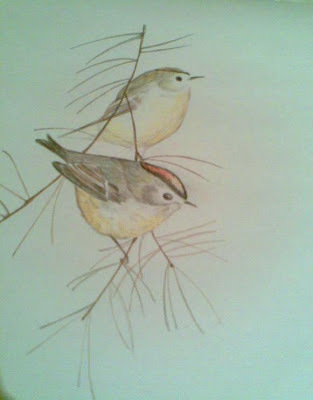 Luckily for many a good breeding season helped restore the population balances, but this cold snap, if it is prolonged could cause another population crash of this years juveniles, especially of the smaller passerines, such as wren, goldcrest and so on. I hope they come to the feeders soon. One bird I shall not worry about is the Jay. This glorious bird sits most morning outside my office window. Today I had my camera with me and managed to snap this shot through the glass. I tried to lift the window but off it flew. Jays are common in Clifton and used to be very secretive. Now though they are becoming bold, or bolder. And I love the fact they are around these busy streets. If jays weren't crows, or so common, people would be desperate to take photographs of them. Just look at the plumage of a Jay the next time you have a chance and see how beautiful it is, with that lovely flash of electric blue along it's flanks. Well that's enough of this winter wildlife, it's time to head home into the Bristol traffic and then have a nice cup of tea. I wonder if I am the only person in the UK not blogging about the snow and the weather. Oh go on then. The snow in Northumberland is bad, friends of mine in the upper reaches of the Coquet Valley have nearly 3 feet outside their door. Luckily the man of the house works for the National Trust so has a 4x4 to get to work, but other than that nothing much is moving. There's a nice news clip from the BBC News here. Good to see Rothbury in the news again. Actually this posting had been planned for last week before the snow arrived as I found myself in the Lake District, Windermere to be precise and Dumfries and Galloway for work. And while the weather was cold, it was just lovely frosty mornings and blue, blue skies. I drove south on Wednesday evening and by Thursday morning, the eastern side of the country was under a blanket of snow. I remember as a child the huge snowfalls an easterly wind brought into the north east. Back to my trip. There can be few better places than the Lakes on a cold and frosty winters afternoon. Last Wednesday having a few hours to spare before driving home (and to miss the chaos of rush hour traffic on the M6) I went for a very pleasant walk around Grasmere. Which is where these photos come from. Nothing too spectacular, just pleasant. On the way to Grasmere I stopped off en route to walk around the Castlerigg Stone Circle near Keswick, which I last visited nearly 20 years ago. This was Wednesday last week, which saw me start that day off at Caerlaverock in Dumfries and Galloway. An early start was needed, as I was there to record a Living World on Barnacle Geese. this meant that at 6.30am on a cold, frosty and wonderfully moonlit morning, I found myself standing on the Solway merse (salt marsh) watching the dawn rise over the Lakeland Hills. And we waited and we waited and then, as if one bird decided to go, 2-3,000 barnacle geese flew over us, calling. What a fabulous sight, something I'll never forget. It was such a privilege to be allowed on the the WWT Caerlaverock site before dawn and be down there in the moonlight, just myself, the presenter and the man from the WWT, in the frosty silence. Night time isn't ideal for a photo so I took this one above the afternoon before, when I did a recce. And then after the recording the geese themselves in the adjacent fields. Caerlaverock is a special place as although a WWT site, it doesn't contain a collection of pinioned or research birds. So every bird on the reserve is a wild bird. The barnacle geese here are almost the entire Spitsbergen breeding population, so a lot of conservation effort goes into their winter welfare. But everything there is wild, including about 100 Whooper Swans, which a week or so before were in the arctic, but now make this area their home for the winter. I love whooper swans. I remember years ago 2 or 3 arrived on the lakes at Cragside in Northumberland and watching them in this wild place, the estate being closed to the public for the winter, I could observe them unhindered. A true call of the wild in the winter. Finally, this Sunday sees the final Living World of the year. On November 1st I travelled to Shropshire to record a raven roost. Ravens are another of the fascinating birds this Island should be proud to have living here. Big, superb flyers, steeped in folklore, and well just too clever for us. 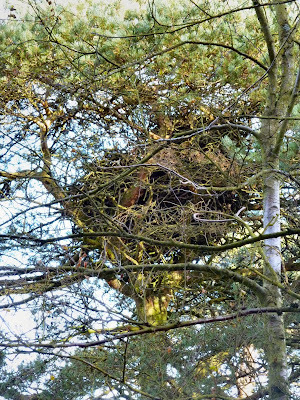 En route to the roost sight, (which sadly I can't telly you where) we visited a raven nest. 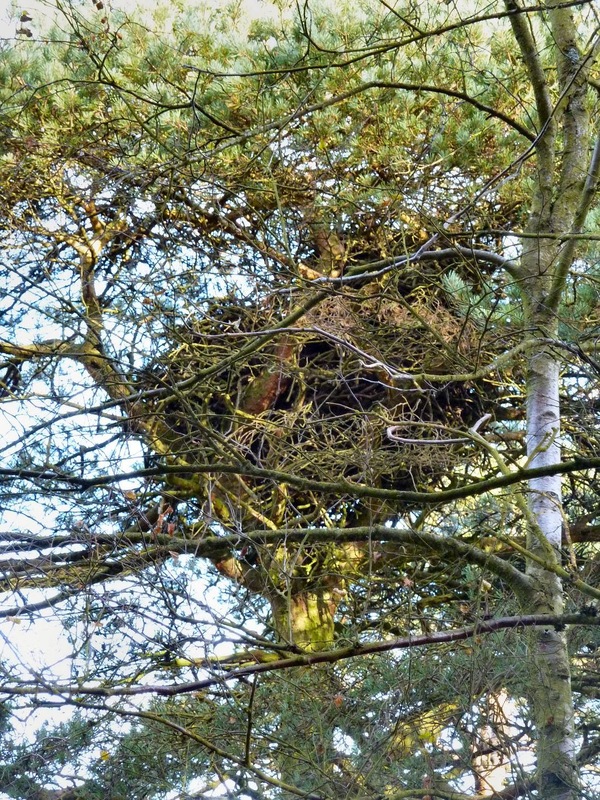 Ravens build a nest as big as an eagles, and this one was in a Scots pine, no taller than 30 or 40 feet. What is remarkable is that in Shropshire all bar a couple of raven nests are in trees and increasingly near lowland farmland. This much persecuted bird, is finally making a comeback into lowland Britain. So make a date in your diary, Sunday December 5th at 06.35hrs on Radio 4 to listen to 2 raven experts from the Shropshire Raven Study Group extolling the excitement of these wonderful birds. The link to the programme is here. A shameless plug I know, but having seen the roost, and witnessed tumbling and pairing flight displays as early as November 1st, I want to share this experience with the blogging world. On Friday, the weather dawned fair of face so instead of doing some housework or DIY I decided to spend the last day of my week off doing a bit of birdwatching at Wiltshire Wildlife Trust's Langford Lakes. I first visited this reserve in 2007 at the beginning of my painting phase proper as I had my first exhibition of 5 paintings here as part of a River Wylie art show. I've not returned since. But on the way I drove over Tidcombe Down, a few miles from home, on the Wiltshire / Hampshire / Berkshire border and I'm glad I did as in front of me on a lonely road a Raven was mobbing a Red Kite. I stopped to watch this for 5 minutes enthralled by both birds fantastic areobatics. An absolutely fabulous beginning to the day... now that really is wildlife on the move!! ............... I arrived at the reserve! To be greeted by an interesting sign and information board adjacent to a mansion itself. I was quite impressed by this mini-beast mansion. I'm not sure, sadly, it'll be as successful at my home as opposed to here by the river Wylie surrounded by mini-beast rich habitat. This area is owned by the Langford Trust, as opposed to the Wilshire Wildlife Trust, and is a wonderful example of local community landscape conservation in action. Not only did this mute swan serenely watch my passing, but just around the corner the azure flash of a kingfisher competed with the azure sky overhead.Though sadly too quickly off it's perch for a photograph. Retracing my steps to Langford Lakes I headed first to the south hide which with its large expanse of open water. This reserve is the wildlife culmination of gravel workings and a former fishing enterprise. Gravel workings when sensitively managed back to wildlife are a fabulous are to watch birds in the winter and Langford Lakes is a cracker. Including sadly this very sick greenfinch, presumably suffering from the awful trichomonosis infection. Sadly I don't think this bird will survive the day. But not all the wildlife at the reserve was expected, such as this rat, one of half a dozen which were feeding underneath the feeders. Apparently they were being preyed on my a stoat, which I failed to see as I sat watching them. Eventually though the sun was beginning to dip, the temperature began to drop so I reluctantly decided to leave the birds to their feed and head back home. An excellent day indeed, given the number of birds I saw in such a small area of this wonderfully picturesque part of Wiltshire. I'll not leave it 3 years before returning again. Where is a tripod when you need one? Last night just before retiring to bed, we looked out of the French windows and there, in all its lunar glory was the moon, peeking through the clouds and the trees at the bottom of the garden. After a few wet and miserable days, to see this was wonderful. Very uplifting. Indeed very mysterious having the garden bathed in moonlight. So of course before heading off to bed I had to try and capture that image with the camera. Changing the auto settings to starry skies, I had a choice of 15, 30 or 60 second exposure. I chose the middle of the trio and set to work. Now this is where having a tripod with me would have been beneficial. Holding a camera steady for 30 seconds, even if wedged between bricks, old newspapers or plant pots may have provided the effect I craved, namely, slightly blurred sky, but in focus trees. But not last night. Even propping the camera on an upturned broom didn't help. It's amazing how much one shakes when trying to be absolutely still. However although they may not be sharp, these photographs do give the feel of the wonderful mood last night, not a breath of wind, a tawny owl and pheasant calling somewhere and apart from those two birds, no other sound in this most rural part of the Wiltshire countryside. I thus retired and spent a night dreaming of how to improve the next moonbeam pictures, a tripod would definitely help. Having a week off in November isn't something I'd planned but so far it is a great way to prevent the onset of those winter blues. On Sunday a friend and I headed off to the Somerset Levels in less than exciting weather but seeing 50+ Snipe at the RSPB's Greylake reserve is a sight I'll never forget. But today I woke to deep blue skies, some mist, but a severe frost, in deepest Wiltshire. This area of Wiltshire just south of Savernake Forest is a bit of a cold spot. Leaving the house at 8am this morning to take Molly the cat to the vets, the temperature gauge on the car glowed a bracing minus 3. Cold enough for me thank you. Molly didn't look too chuffed either. After the vets Julie and I did a few chores and a coffee in the Polly Tea rooms in Marlborough, before Julie went to work leaving me to fill in a few hours before Molly had to be collected. So I headed off to Wilton Brail. This is a piece of open access woodland between home and Great Bedwyn. By now the sun was up and there was some heat in those rays, meaning the frost of the morning had gone, well except where the sun didn't reach. Leaving the car by the road I walked up the track. A few birds were floating about, including a strange looking bird flitting between the tree tops in the above photograph. It's flight was odd and fluttery, like that of a bat. I got the binoculars out and lo and behold it was indeed a bat. This was about 12.30 pm and quite remarkable. I did attempt a photo but failed completely, so positive identification was problematic, but my money is on a Noctule. It is late in the season for this species to be flying, even if I ignored the fact it was flying mid day, the size, flight pattern and habitat all point that way. I just wish I'd had a better view. Exciting though. That excitement over I continued the walk. The weather could not have been better. Clear blue skies, no wind and with a strong sun, ample photo opportunities to try and capture the light through the trees. The view back towards Bedwyn Brail on the hill, where the plaintiff drone of a chainsaw emanated. Photographs never do justice to an atmospheric image in real life. Anyway I eventually reached an area where a ride had been opened up. I walked this route in September and it was dark and brooding. But today with a 10 meter ride having been opened recently the sunlight flooded in. As I walked I heard the familiar jangling call of common crossbills flying overhead, 7 in all. Not that surprising as Savernake Forest just a few miles away has a resident population. Also flying nearby calling was a raven. I like this walk. The woods aren't too sizable but it is quite varied. The photograph below was taken with my back towards a field. A short hop and skip over that field and I'd be at the Kennet and Avon canal. A circular route therefore could be woodland, fields, canals and back through woodland. I may post this one day. And being on the northern edge of the wood, frost remained where the sun didn't shine. All too soon I had to retrace my steps and back to the car for a 5 minute drive home and a welcome cup of tea. Julie then returned, we picked up Molly from the vets and all is well. So as holidays go it may not be a World trip, but very relaxing and in today's glorious weather, very, very enjoyable. I'm enjoying myself. And briefly to finish this posting a link to the latest Living World I produced, Native Hedgerows. Rob Walton was the contributor and with the presenter Lionel Kelleway provided a wonderful programme. This went out on Sunday, but was then also featured on Radio 4's Pick of the Week, which was very exciting. Well it was for me, because it was picked by a presenter as a highlight of the weeks radio.